About two thirds of the world’s landmass is subjected to temperatures below freezing every year and about half regularly suffers temperatures below -20°C. With the exception of those areas that are permanently frozen, plant life manages to prosper in these cold conditions. Some plants are hardier than others. Those from warmer climates, citrus or rice for example, are severely damaged or killed by a light frost. Obviously plants are adapted to their natural habitat, so how do those adapted to life in cold climates manage to survive? I explore the answer in this note, and start by looking at what happens to water when it freezes. A liquid that looses heat and cools down will eventually freeze 1. Freezing is the process whereby the liquid turns into a solid and the temperature at which this happens is called the freezing point. Melting is the opposite of freezing and occurs at the melting point. The physics and chemistry are such that the melting point for any given substance is fairly constant whilst the freezing point can vary considerably. Most liquids freeze by crystallisation. A crystal is a solid whose constituent atoms or molecules are arranged in a regular, repeating pattern extending in three dimensions. Crystal formation occurs in two stages - first nucleation and then crystal growth. When the temperature is low enough, molecules of the liquid begin to gather in nano-scale clusters and arrange themselves according to the requirements of their crystal structure. If the energy balance is favourable minute, nano-scale crystals will form - these are nuclei and the process is nucleation - otherwise the cluster will disperse back into the liquid. So what makes the energy balance favourable? Energy is needed to create the surface between the liquid and crystal. The amount required depends on the area of surface being created. On the other hand, energy is released when the crystal is formed. The amount of energy released depends on the size (= the volume) of the crystal. If more energy is required to make the surface than would be released in forming the crystal, the crystal nucleus won’t be created. Since volume increases faster than surface area as objects get bigger, there will be a cluster size at which enough energy is released to create the surface and form the crystal. (This is the critical cluster size.) As temperature is reduced these parameters change and eventually the molecules will succeed in achieving this critical cluster size and enough energy will be released to form stable nuclei. Crystal growth can proceed at great speed once the nuclei have formed, because the rule relating volume to surface area means that, as it grows, more and more energy is made available to create the crystal’s surface. Crystallisation at can be promoted by the presence of nucleating substances, for example irregularities on the surface of the containing vessel, minute bubbles and impurities, such that freezing occurs at higher temperatures. Nucleating substances accelerate crystallisation because when a crystal nucleus forms on the substance it destroys part of the substance’s surface with the liquid. The energy released by this event tips the balance in favour of crystal formation. Or, to look at it in another way, less energy is required to form the surface between crystal and nucleating substance than either between crystal and liquid or nucleating substance and liquid. The presence of nucleating substances can raise the freezing point to be near or equal to the melting point. In the absence of nucleating substances freezing usually begins at lower temperatures than the melting point. Liquids in this state are said to be super-cooled. For example, at normal pressure, water melts at 0 °C. It freezes close to 0 °C in the presence of nucleators, but can supercool to -42 °C before freezing in the absence of nucleators. It is possible for a liquid to harden without forming a crystalline structure. Glass is an example. Transition from liquid to such an amorphous solid2 does not occur at a single discreet freezing point, but happens gradually over a range of temperature. Nonetheless, a critical temperature region can usually be discerned and this is called the glass transition temperature. For substances like water which normally freeze by crystallisation, special conditions are required to make them freeze into an amorphous material. One method is to cool them so rapidly that the molecules do not have the time to move into the crystal’s lattice arrangement. For water the required rate of cooling is so high that this can only happen in the laboratory. However, a second method is to include additives which interfere with the ability of the liquid’s molecules to crystallize. The resultant frozen amorphous material is said to be vitrified, and when the additive is in a living tissue it is called a cryoprotectant. For example, added soda makes silicon dioxide freeze into glass, and added glycol3 stops (crystalline) ice formation and makes water freeze into a vitrified solid called amorphous ice. The glass transition temperature for water is estimated to be about -108 °C. Actually what we commonly distinguish as frost, rime, snow and ice are all forms of frozen crystalline water 4 that have been created in different atmospheric and surface conditions - ice from liquid water; rime from water droplets, snow from water vapour crystallizing in the air, and frost from water vapour crystallising onto cold objects on the ground. Ice can be transparent or coloured if it includes impurities. The most common impurity affecting the colour is air which gives it an opaque bluish-white appearance. Black ice is actually transparent - it has frozen without including air bubble impurities. It thus takes on the colour of the surface beneath it, which in the common usage of the term is tarmac, making it a significant hazard to drivers and pedestrians. Rime is formed on cold objects when drops of water crystallize onto them, for example in foggy weather when the temperature drops below zero. The fog or mist usually freezes onto the windward side of the tree branches or object on which it is forming. If it contains a high proportion of trapped air (soft rime), it is white and looks very much like frost. At the other extreme, it can be transparent and look very much like the ice deposited by freezing rain 5. Soft rime is fragile and can be easily shaken off; clear ice rime (and frozen rain) are much more tenacious and, therefore, potentially damaging to the object supporting it. Snow forms when water vapour condenses directly into ice crystals around nucleating dust particles. These crystals typically have a diameter of several millimetres and their shape is determined by the temperature and humidity when they form. For example, six petaled ‘flowers’ form in air temperatures between 0 and -3 °C whilst needles, hollow columns or prisms form in temperatures between -5 °C and -10 °C. Many crystals aggregate to form snowflakes which can be much larger. Because of the open structure of the crystal and the loose nature of aggregation into snowflakes, the depth of lying snow is not a good indicator of its weight (and, therefore, its potential for mechanical damage to its supporting structure). Newly fallen snow commonly has a density of between 5% and 15% water - the ‘flower’ type crystals have more air spaces and the snowflakes they form produce less dense (dry) snow than columnar or plate-like crystals. Once the snow is on the ground, its density will increase as it settles and, in the longer term, due to melting and refreezing. Frost is formed when water vapour in the air is deposited as ice crystals directly onto a cold surface. To form frost both the air temperature and surface temperature must be below freezing 6. Frost will form preferentially on objects that give up their heat easily, such as blackened metal, or where the air is moister, such as plant leaves. Its formation is sometimes patchy, occurring more frequently or more sverely in hollows and valleys because colder air is more dense and hence tends to sink into such depressions. Weathermen (and gardeners) often distinguish between air and ground frost. This is because their standard measurement of temperature is taken at 1.5 metres above the ground, but the temperature at ground level can very different, usually colder. 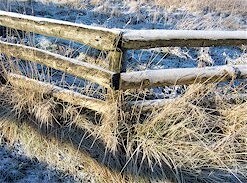 A ground frost usually indicates more severe conditions than an air frost. These figures are only a rough guide to the effect of temperature because other factors such as aspect, maritime influence and aridity are also important. Freezing winters commonly occur in temperate latitudes, especially in the interior of continents away from the moderating effects of nearby oceans. Regions with a continental climate are characterised by having at least one month with average temperature below 0 °C. The daily average winter temperatures being between -12 °C and 7 °C during the day and between -23 °C and -4 °C at night. Periods of sub-zero temperatures can even be found in the tropics at high altitude on the few highest mountains. In the broadest terms vegetation is zoned according to the harshness of the climate. Moving away from the snow line, i.e. to ever less harsh climates from the perspective of temperature, one encounters first tundra, then taiga and then temperate forest or grassland. Tundra is an area where the tree growth is hindered by low temperatures and short growing seasons and so the vegetation is composed of dwarf shrubs, sedges and grasses, mosses and lichens. Its climate has at least one month with an average temperature high enough to melt snow, but no month with an average temperature higher than 10°C. The tree line separates tundra from the forests of the taiga. These are dominated by evergreen conifers but also include some small-leaved deciduous trees like birch, alder, willow and aspen, mostly in areas escaping the extreme winter cold, and the deciduous larch. Winters have at least 5-6 months of sub-zero average temperatures. Across the year temperatures may vary from -50 °C to 30 °C, with eight or more months of temperatures averaging below 10 °C. Moving equator-wards the taiga merges into temperate forests or grassland much more gradually than it merges into tundra at its pole-wards, tree line boundary. It is largely rainfall that determines whether taiga merges into forest or grassland, grassland growing in the more arid climates. The forests may be composed of just broadleaved trees or be a mixture of broadleaved and coniferous trees. Actually the most severe temperatures are not necessarily experienced by plants growing in the most severe climates, because if they are covered with snow during this period they can be insulated from the worst temperatures. The plants of the tundra rely on this effect. Many plants can be damaged or killed by cool or freezing temperatures, especially if they have been planted outside their natural range of distribution or are growing close to the edge of that range. Plants from the tropics or sub-tropics, like rice or tomatoes, are said to be tender and die when they are exposed to frost; plants from temperate climate can tolerate lower temperatures and are said to be hardy. The degree of hardiness varies. Plants that are not killed outright by lower temperatures can suffer various types of damage. In many perennial plants, such as the hosta, the above ground parts turn completely brown and die back after the first frosts, but they grow again from soil level or sub-soil level buds in the spring. Other herbaceous perennials will drop their leaves and flowers, leaving just stems and stalks. Woody evergreen plants can withstand very severe frosts without damage although most growth stops during this period. Extremely cold temperatures can result in freezing of the internal sap of trees and kill them. In woody plants much of the damage does not become apparent until spring when new growth begins. Leaves are typically less hardy than buds or stems; flower buds are typically less hardy than leaf buds; young seedlings are typically less hardy than mature plants. Certain bacteria, notably Pseudomonas syringae, specialize in exploiting the half-hardiness of certain tissues, such as fruit skin. They produce specialized proteins that serve as potent ice nucleators, causing ice formation at temperatures as warm as -2°C, leading to injury of the fruit’s skin. The bacteria gains from the release of nutrients from the underlying plant tissues. Within stems, xylem tissue tends to be less hardy than cambium and phloem tissue. That in small branches is most prone to damage. Xylem damage can result in the plant or branch being slow to come into leaf or flower in the spring. Sudden and wide fluctuations in temperature can also damage frozen wood. When the sun warms one side of the trunk to above freezing, it causes some expansion of the warmed wood and where there are natural lines of weakness this can cause cracking. Cup shakes and frost cracks are all types of this form of damage Cup shakes is a separation of wood along an annual ring where unfrozen outer layers separate from still frozen inner layers. Cup shakes are not visible externally but weaken the tree. Frost cracks occur when an unfrozen trunk freezes quickly so that the outer trunk layers shrink faster than the inner layers. This results in a long longitudinal split in the bark often accompanied by a loud cracking noise. Plant roots are much less hardy than plant shoots. Generally this is OK because soil is a pretty good insulator, but in very severe weather root damage can occur. Because of its insulating properties, such damage will usually occur in the top few inches of soil - once frozen, soil temperature remains fairly constant, at least at depths greater than 6 inches - so it is the surface feeder roots that are most affected. The amount of damage will depend upon many factors, for example root hardiness, general depth of rooting for the species, soil texture, and depth of leaf cover. It may be that a greater degree of damage will result from frost heaves. This is lifting of soil that occurs when it freezes and it can break apart roots. Heaving can affect grass, bulbs and perennials as well as shrubs and trees. As with shoots, root injury will not usually become apparent until spring. At very high latitudes the sub-soil is permanently frozen permafrost. This can prevent trees from getting their roots deep enough for the necessary structural support and result in wind-throw. Mechanical damage can occur to branches as result of heavy snow loads. In Finland snow load was found to be as much as 3000 kg per tree 350 metres above the snow line and at this height a high percentage of trees had broken tops. Pine and spruce faired worse than birch. Freezing conditions before snowfall can exacerbate the problem because frozen branches are more brittle, and freezing rain can be a still more potent cause of mechanical damage. Freezing rain is more potent because unlike snow it does not readily slide off tree branches - when the supercooled rain hits a branch it turns to ice and sticks. Accumulations of ice have been estimated to increase the weight of a branch by as much as 30 times. As little as ½ cm of ice can begin to cause small limbs to break. At 1 cm, accumulations can break large limbs. It is perhaps as well to remember some of the salient features of a plant cell before looking at what happens as the temperature drops and the world outside of the plant begins to freeze. Think of a sealed plastic bag filled with water placed inside a card-board box as a rough and ready model of the plant cell. The water represents the liquid (actually jelly-like) contents of the cell called the cytoplasm and the plastic bag the fatty membrane surrounding them and mostly keeping the inside in and the outside out. Together the cell membrane and cytoplasm are the living part of the cell (called the protoplasm). The cardboard box represents the plant cell wall which is the more or less stiff layer of complex carbohydrates that keeps the plant erect - it is the plant’s skeleton. The cytoplasm is more than just a jelly-like liquid. It also includes other membranes, similar in construction to the cell membrane, and organelles, mostly notably in plants the chloroplast which harvests light by photosynthesis. Membranes do let some selected molecules in and out - they are semi-permeable - and they are the site of very many of the chemical reactions that keep the cell alive. They work because of the properties given to them by the particular fatty molecules used to build them, most importantly how fluid they are. Unfortunately for the plants these properties are seriously affected by temperature. As temperature falls, the first affects, which occur above freezing, are that all of the cell’s membranes will become less fluid and the activity of some enzymes is reduced. These effects can be the cause of chilling injury. Then, at lower temperatures still, ice will form outside of the cell membrane. This ice is formed in the non-living part of the plant and so it won’t necessarily damage it directly, but it does cause dehydration of the living part. As the liquid water located outside of the cell membrane joins the ice crystals it has the effect of making the external solution more concentrated than the cytoplasm. This difference in concentration draws water out of the cytoplasm. As more ice forms, more water leaves the cells. If the temperature becomes so low that ice forms inside the cell membrane, i.e. in the living part of the cell, the damage is so great that the cell will die. So, low temperature stresses the plant cell in two ways - by the effect of low temperature alone, and by dehydration of the cells. When membranes suffer a decrease in fluidity their ability to pump molecules in or out is impaired. Light harvesting by photosynthesis, which is much less affected by temperature, continues apace, producing lots of high energy reactive molecules (oxidases). These would normally be consumed by the next steps in the photosynthetic chain of reactions leading to the production of sugar, but because this relies on fully functioning membranes, they are left to roam. They react instead with other cell contents and destroy them. Dehydration by freezing takes place to quite a significant extent, for example more than 75% of the water in a frost-hardy evergreen leaf of Pachysandra can be frozen into the ice formed outside of the cell membrane. Dehydration can eventually affect the functioning of the cell’s membranes, which need liquid water to keep their constituent fatty molecules aligned into the membrane’s structure. Crystalline ice cannot substitute for liquid water for this, although amorphous ice can (so vitrification is a means of achieving extreme frost tolerance at least from the perspective of membrane function). Excessive increases in the concentration of salts as the cell becomes more dehydrated may also cause injury. Also the living part of the cell shrinks away from the cell wall as it dehydrates. This may break the ‘tubes’, called plasmodesmata, that go through the cell wall and join adjacent living cells together. Finally, if shrinkage is excessive it may damage the cell membrane to the point where it is unable to recover upon thawing. Differential effects on the cells in different tissues can upset the physiological balance of the whole plant. For example, whole plant water stress brought on because root and leaf cells have different tolerances to cold can be a major cause of chilling injury, i.e. injury due to cold temperatures above freezing. In this case leaf and shoot cells are more tolerant and continue with their normal loss of water through open stomata whilst the roots are unable to keep pace. The low temperatures have more drastically affected the root cells’ membrane fluidity and thereby reduced the roots’ permeability to water. 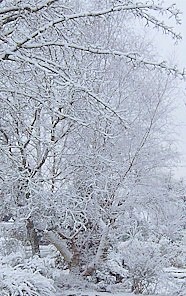 A plant’s response to cold is ultimately decided by its genetic make-up and can be a long-term adaptation in terms of growth form, seasonal growth pattern or internal chemical composition, and/or short-term acclimation by changing its internal biochemistry to enable it to withstand seasonal cold periods. Plants from locations which do not normally have seasonal cold periods, i.e. the tropics and sub-tropics, do not usually have a growth pattern or form that helps with cold tolerance nor do they have the ability to acclimatise, whilst plants from locations with seasonal chill do. Avoidance of the most severe frost is a strategy adopted by many plants, by dying back to ground level or below ground level over winter, or by growing low enough to ensure that snow cover will provide insulation. Alpine plants like Ranunculus glacialis and Saxifraga oppositifolia can grow right up to the snow line, but since in some years these plants are never uncovered, they must have other adaptations to ensure survival in the dim, wet and bug-ridden world beneath the snow. Conifers that grow at high latitudes or high altitudes, where snow fall in the winter is regular and heavy, have a crown structure that encourages snow to slide off. They have an overall conical shape and both the main branches and side branches tend to point downwards. Deciduous trees, of course, shed their leaves. This will have a huge beneficial effect on preventing snow build up (although whether it is just an advantageous side-effect of the deciduous habit or a significant contributor to the adoption of the habit is impossible to say). Being evergreen appears to be advantageous for plants living in locations with severe winters, but this growth form may only be indirectly attributable to the cold. Certainly, evergreen conifers dominant the tree line flora. In very cold areas, such as the far north taiga, mineral nutrient availability is low because low temperatures impede the development of rich soil. Because the leaves of evergreens live longer than those of deciduous tress they make more efficient use of mineral nutrients and so evergreen plants are better able to grow where nutrient availability is low. Plants with the appropriate genetic make-up are able to acclimatise to cold conditions by changing a variety of aspects of their biochemistry in a process we commonly call hardening, when acclimatising from warm to cold conditions, and de-hardening when acclimatising from cold to warm conditions. The changes for hardening include altering the composition of membranes to make them more fluid, synthesis and accumulation of cryoprotectants and increasing the potential to remove rogue high energy reactive molecules (oxidases). Membranes are predominantly composed of a double layer of fatty acids. These molecules are shaped like tadpoles, and in the membrane they are aligned so that the head of the tadpole faces outwards from the membrane and the tail faces inwards. It is believed that at low temperatures the tails are packed more closely and this has the effect of reducing membrane fluidity. In some fatty acids the tails are straight (i.e. in so called saturated fatty acids 8) whilst in others they are kinked (i.e. in so called unsaturated fatty acids). Those with straighter tails can be more closely packed and therefore become less fluid9 at a given low temperature than those with more kinked tails. The composition of plant membranes changes to include more unsaturated fats as they harden. The membranes of chill resistant plants have been found to have about a 4:1 ratio of unsaturated to saturated fatty acids. In chill sensitive plants the ratio is about 2:1. In cotton plants (Gossypium) this even happens on a daily basis. As they prepare for the lower temperatures of night the levels of two unsaturated fatty acids, linoleic acid and linolenic acid, rises and it falls again during the day. As the temperature drops below freezing the plant must adopt a strategy with regard to ice formation - when and where ice crystals are allowed to form and how big they are allowed to grow. First, it is essential that crystals do not form within the living protoplast. They can be tolerated, albeit at the expense of dehydration, outside the protoplast, that is extracellularly, so long as they do not grow too large. Massive ice crystals could penetrate and kill the protoplast or tear apart the tissue of an organ and so damage its function when the thaw returns the plant to normal physiological function. The plant can prevent ice formation in the protoplast by super-cooling. This is achieved partly by the small size of the cell protoplast and partly by the build up of cryoprotectants, which are typically soluble carbohydrates. Olive leaves can supercool down to about -15 °C whilst the more hardy apple and maple can supercool certain tissues down to the -40 °C limit. In apple, the xylem supercools down to this limit whilst the bark freezes extracellularly. In forsythia, the flower buds supercool whilst nearby stems freeze extracellularly. In extremely cold tolerant species, ice formation in the protoplast can be prevented at temperatures below -40 °C by vitrification induced by high concentrations of sugars, particularly sucrose, raffinose, and stachyose. Vitrification enables the hardened of twigs of poplar to survive immersion in liquid nitrogen. The site of extracellular ice formation is determined by nucleators. These are often surface contaminants, including bacteria, in herbaceous plants, whilst in woody plants they are more usually internal constituents. The precise constituent seems to vary from species to species and may include carbohydrates and proteins. Crystal growth is controlled in some species by the production of anti-freeze proteins that prevent re-crystallisation - the growth of large ice crystals at the expense of small ones. As we have already seen, oxidases are produced as a normal part of photosynthetic activity and the plant attempts to consume them usefully in the next stage of the process as soon as possible. However, because they are so highly reactive, plants have also evolved antioxidant systems to scour any rouge oxidases that have escaped from normal processing. Both antioxidant enzymes and antioxidant compounds are used. In general plants that can acclimatise to cold are able to increase their tolerance to oxidases by increasing the level of their antioxidants and, interestingly, the concentration of antioxidants in high altitude plants shows a diurnal fluctuation with the highest levels being found during the daylight hours. As usual the particular enzymes and compounds involved varies between species, as does the degree to which this particularly protection mechanism contributes to cold tolerance. Another method used by plants to combat this problem of rouge oxidases produced by photosynthesis is to re-arrange the balance of light harvesting pigments to include more xanthophylls. In this way less energy is produced or that which is produced is quenched. The flowers of a very few plant species have the bizarre ability to raise their temperature well above ambient. Actually, this is mostly thought to be related reproduction and the attraction of insects rather than to cold tolerance. The flowers of skunk cabbage, Symplocarpus foetidus, native to north America and north-eastern Asia, have the incredible ability to raise their internal temperature by 15 to 35 °C and maintain this for two weeks or more. It blooms in February and March when the ambient air temperatures range from -15 to 15°C and it often melts the snow covering it. Clearly the changes in cell biology brought about by hardening are not much use if they don’t happen until the potentially damaging temperatures actually occur. So plants must prepare for the change in climate ahead of it actually happening. Two environmental signals are known to trigger hardening - shortening day length and reduced ambient temperature (but obviously not exceeding the plants cold resistance!). In Pinus sylvestris both signals are independently effective and the maximum rate of hardening they have been found to induce is just under -1 °C per day. During the summer needles of P. sylvestris are lethally damaged when exposed to -10°C, but after hardening they can eventually become tolerant to frosts lower than -72°C. So hardening is a slow process and it continues as the temperature gradually drops. Thus a prolonged exposure of already moderately hardened plants to mild frosts induces further hardening to the final stage of extreme frost tolerance. Since evergreen conifers keep their needles for several years, de-hardening of the frost tolerant needles in spring is important to enable them to make full use of the improving climate. In principle de-hardening is the reverse of the processes involved in hardening, and particularly important is the restitution of the systems supporting photosynthesis which have been degraded in the course of frost hardening. Alpine Plant Life: Functional Plant Ecology of High Mountain Ecosystems. Christian Körner, Springer, 1999. Effects of Cold January Temperatures on Landscape Plants. Ron Kujawski, UMass Extension. Life in the Frozen State. Barry Fuller, Nick Lane and Erica E. Benson, CRC, 2004. Plant Physiological Ecology. Hans Lambers, Thijs L. Pons and F. Stuart Chapin, Springer, 2000. Plant resistance to cold stress: Mechanisms and environmental signals triggering frost hardening and dehardening. Beck E H, Heim R and Hansen J, 2004, J. Biosci. 29:449-459. Potential for winter damage to trees and shrubs. Al Cooke, Chatham Journal Weekly. Science: How plants prepare for the cold of night. New Scientist, 17 April 1993. Snow load on spruce trees (Picea abies) at different altitudes in Riisitunturi. Nils Dittbrenner and Karel Moravec. 1 Except helium which is still liquid at the lowest possible temperature, absolute zero, -273 °C. 2 Because there are differences between glasses and solids, many scientists consider glasses to be viscous, or stiff, liquids, so a better term is amorphous material. Over centuries, glass does indeed flow. 3 Ethylene glycol is used for car anti-freeze, propylene glycol has been used to prevent ice formation in ice-cream and glycerol is used to protect sperm from ice formation when they are stored for artificial insemination in liquid nitrogen. 4 In scientific terms these are all ice, that is solid, crystalline water arranged into a hexagonal crystal structure. 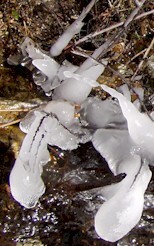 5 Freezing rain is formed by a different process to clear rime ice. It starts falling as snow at high altitudes, melts to liquid water in warmer air at a lower altitude and is then supercooled by a further cold air layer lower still in the atmosphere. It freezes on contact with the surface it lands on. 6 The relative temperatures of the air, the surface and the dew point determine whether dew, mist/fog or frost are formed. The dew point is the temperature at which the air can no longer hold all of the water it contains. If the air temperature is less than the dew point temperature mist or fog will form. If the air temperature is above freezing and above the dew point temperature, and the surface temperature is less than the dew point temperature, dew will form. If the air temperature is above the dew point temperature, but both the dew point temperature and the surface are below the freezing point, frost will form. 7 The snow line is the point above which, or pole-ward of which, snow and ice cover the ground throughout the year. The tree line or timberline is the edge of the habitat at which trees are capable of growing. Many environmental conditions can be responsible for preventing tree growth, but we are interested in the alpine or arctic tree line, which, like the snow line, is the point above which, or pole-ward of which it is too cold or snow cover persists for too long, to sustain trees. 8 Saturation describes the type chemical bonding in the fatty acid’s tail. If all of the bonds in the carbon atoms that form the backbone of the tail of a fatty acid are used up it is said to be saturated. If however some are not used up and instead they form a second or double bond with another carbon atom belonging to the backbone the fatty acid is said to be unsaturated. 9 This also partly explains the difference in ‘spreadability’ between margarine and butter stored in the fridge. Butter has more saturated fats; margarine more unsaturated fats.